Elephant Cave has been part of the Tentative list of Indonesia. The Elephant Cave, locally known as Goa Gajah, lies a few kilometres outside of Ubud. 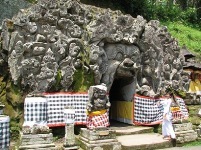 It has its origins in the 11th century, making it the oldest Hindu monument on Bali. The cave is known for its sculptured entrance, where it looks that you have to enter through the mouth of a demon. Inside there are three shiva lingam and a Ganesh statue. Although the cave itself is small, the whole temple complex merits an hour or so. Right in the center is a fabulous bathing temple, including a fountain made of female statues. Further down, near a stream, Buddhist relics are kept.